"One jump ahead of you!" 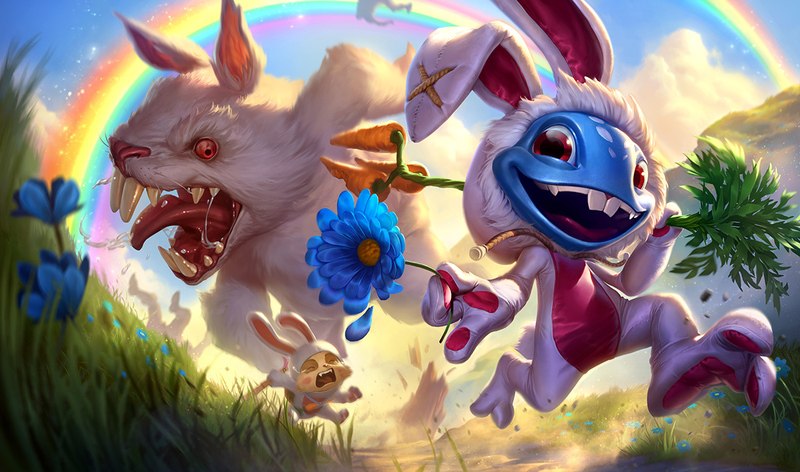 Cottontail Fizz is now available for 975 RP! "Hop through lane, delivering smackdowns like colorful candy eggs as Cottontail Fizz, available in the League store for 975 RP.Anyone else tired of being pushed around by carrots? They’re always strutting around, acting all orange and full of vitamin A. Well, it’s time for payback, you lousy root vegetables. Rising from the fuzziest depths to crush carrots and foolish foes, it’s Cottontail Fizz, a new skin inspired by Spring… launching in Summer. Don’t judge us, it was a cool idea. Hop through lane, delivering smackdowns like colorful candy eggs as Cottontail Fizz, available in the League store for 975 RP." Let's hop on for a better look!